Whether you’re dating, married or looking to rekindle a romantic spark that ignited your relationship, Valentine’s Day sets the mood to celebrate love, friendship, and all that good stuff. With a city offering many escapades and packages, FLOW presents you with an opportunity to win an international dinner buffet experience for two for the value of Rs. 7,800 nett by participating in their photo contest ‘Take a Chance on Love’. Diners are encouraged to tell them their story with a 150-word post of how their partner has made their life special with a couple photograph on FLOW’s Facebook page with the hashtag #ValentinesAtFLOWon or more midnight on 12 February. For advance bookings made before 10 February for the dinner buffet automatically qualify for a raffle to win a 60-minute reflexology treatment by the hotel’s recreational facility therapists. The international dinner buffet is priced at Rs. 3,900 nett per person and includes a glass of Sparkling on arrival, live entertainment, and a red rose for the lady. The buffet menu will be served from 7 p.m. until 10 p.m. with menu highlights including lamb chop with fennel relish, slow-cook filet mignon with port wine sauce, chilli crabs, fried prawn wontons, and a chocolate brownie bar. For bookings, please call Restaurant Manager Ruwan Amarasekera on 0771-001-794 / 0-115-344-644 or visit www.flow.lk. Show your special someone how much they mean to you this Valentine’s Day with a selection of treats. Not only will these decadent desserts satisfy anyone’s sweet tooth, but they’re also absolutely adorable! 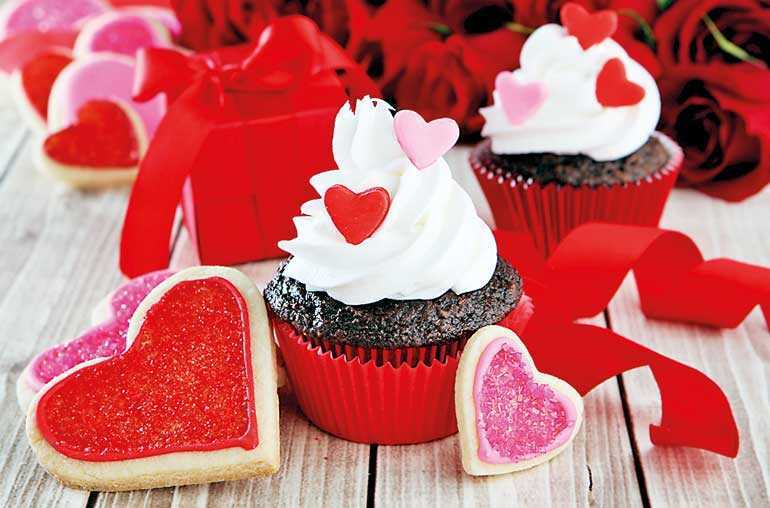 Between 12 and 15 February, BASICO Bar Lounge will offer a selection of Valentine’s desserts including Heart-Shaped Strawberry Gateaux (1kg) for Rs. 4,200, Red Velvet Gateaux (1kg) for Rs. 3,900, chocolate and red velvet cupcakes for Rs. 150, and custom made cakes. Prices are subject to prevailing taxes. For bookings, please call Restaurant Manager Kasun Steinwall on 0777-568-718 or 0-115-344-644. Speaking of the celebrations planned at Hilton Colombo Residences, Priyal Wijesuriya, Director of Food and Beverage commented that each offer is designed keeping the theme of families who will be a part of this celebration. “FLOW will be offering an international buffet that celebrates Valentine’s Day for couples as well as families. We have been recognised as a destination for marketing with five cuisines of Sri Lankan, Indian, Japanese, Chinese, and western, and I am confident that this offer will be well received by the market,” commented Wijesuriya. For more information on the offers, contact the hotel on 0-115-344-644 or www.flow.lk.